To save the aesthetics of Dellrose Street, an aging, 900 ft. long, brick road, the city of Pittsburgh wanted to limit traditional stormwater infrastructure (see part 1). 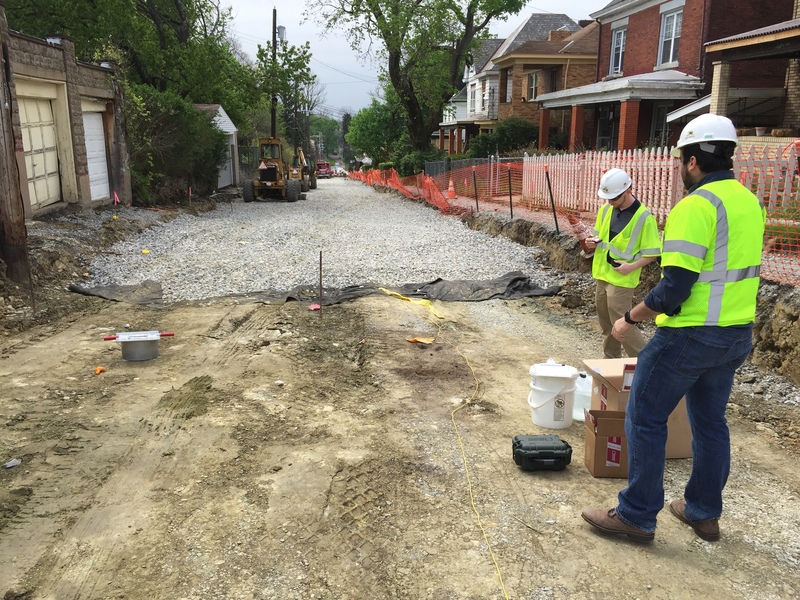 Jason Borne, a stormwater engineer for ms consultants and his team decided permeable pavers was a viable option, and used two different types of infiltrometers to determine soil infiltration potential. Here’s how they compared. How did the Double Ring and SATURO Compare? 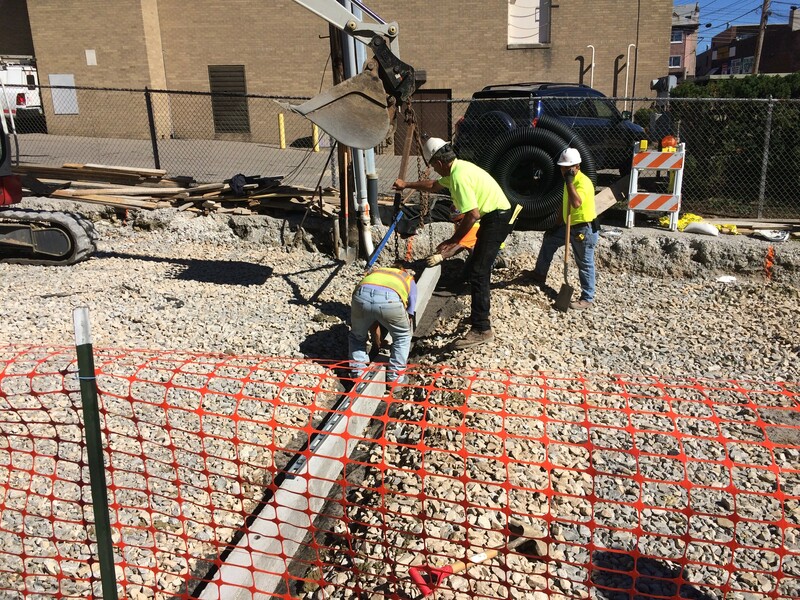 Borne and his team were ultimately able to prepare a permeable paver street design which allowed for the exclusion of traditional storm sewer infrastructure, reducing both capital costs and long-term maintenance life cycle costs. 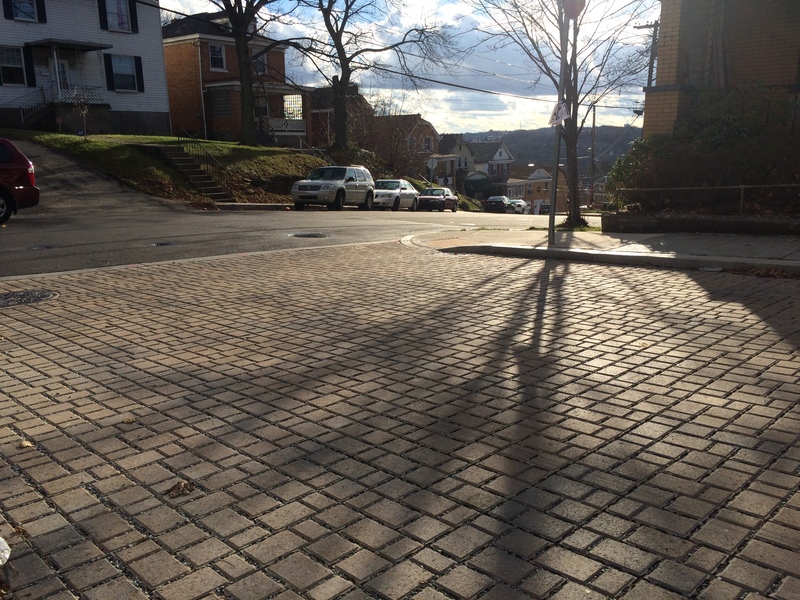 The permeable paver concept is intended to provide a template for the city of Pittsburgh to apply to the future reconstruction of other city streets. With very little recharge and irrigation comprising 75% of groundwater use, natural water resources in the United Arab Emirates region are disappearing fast (see part I). 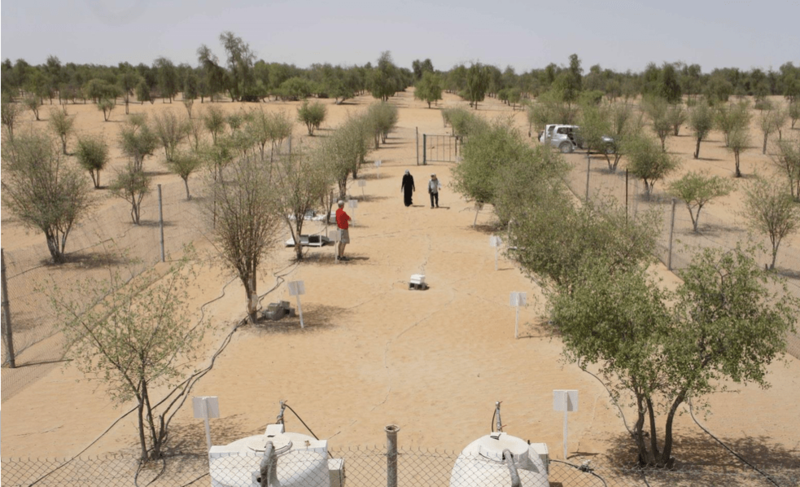 Wafa Al Yamani and her PhD advisor, Dr. Brent Clothier, are investigating using treated sewage effluent and groundwater for irrigating the desert forests along UAE motorways. 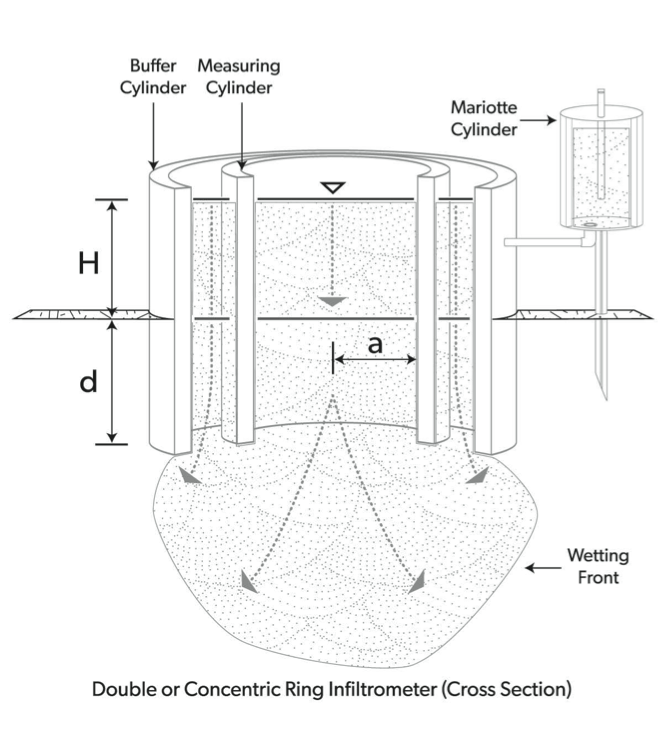 Wafa and her team used what they call, “the Ankeny twin head method” for site evaluation with infiltrometers, and they’ve been able to use it to predict dripper behavior. They begin with the head at -60 mm, do a series of measurements to measure steady infiltration, and repeat the process at -5 mm. They use those measurements to solve Woodings equation which has two unknowns: saturated hydraulic conductivity and capillarity. Dr. Clothier says, “We’ve done it at two heads, and we can use Woodings equation to solve for the slope of the exponential conductivity curve. Hence, I can predict with time, the movement of the wetting front away from the dripper. That’s been very useful to work out what volume of soil we’re wetting. It tells us if we should have one or two drippers. In this forest, we think we can get away with two drippers because if they irrigate for two hours, the radius of the wet front will be 20 cm, and the depth will be about 40 cm, which is a sufficient volume of water for the tree roots.” Dr. Clothier says they also constructed a small dyke around the drippers so they could contain the water inside the drip zone in case of hydrophobicity or uneven sand. Wafa on site, using the twin head method. Researchers irrigated with water from these tanks which stored groundwater and treated sewage effluent. Dr. Clothier says they started with a pilot study in the UAE in 2014, and it was so successful that they ended up with two fully-funded four-year projects, one on treated sewage effluent, and one investigating the irrigation of date palms. He says they have another 3 ½ years of work in the UAE on these projects, and in the end, their goal is to develop a model for forestry irrigation and soil salinity management, along with developing capability for the measurement and modeling of irrigation impacts on sustainable forestry. They have recently developed a prototype of a computerized decision support tool for irrigation which will provide sustainable irrigation advice to optimize water use. The support tool takes into account the need to maintain salt leaching, and actual irrigation records can be entered to enable real-time use. 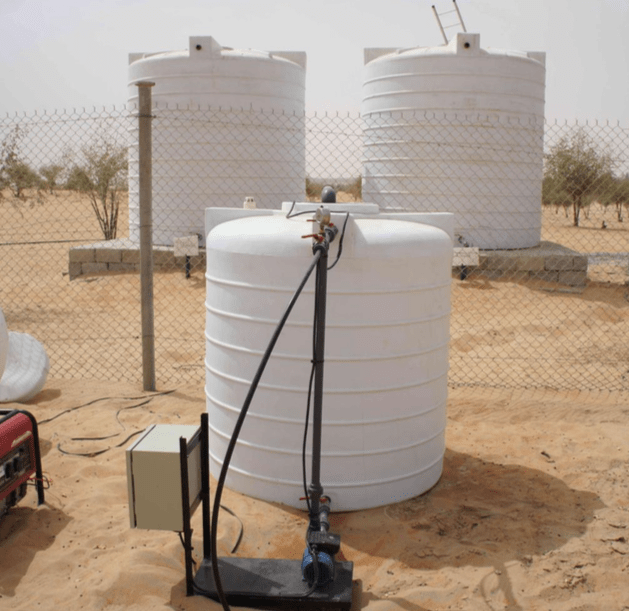 Can Wastewater Save The United Arab Emirates’ Groundwater? The hyper-arid United Arab Emirates (UAE) has a rapidly dwindling supply of groundwater, and that water is becoming increasingly saline. 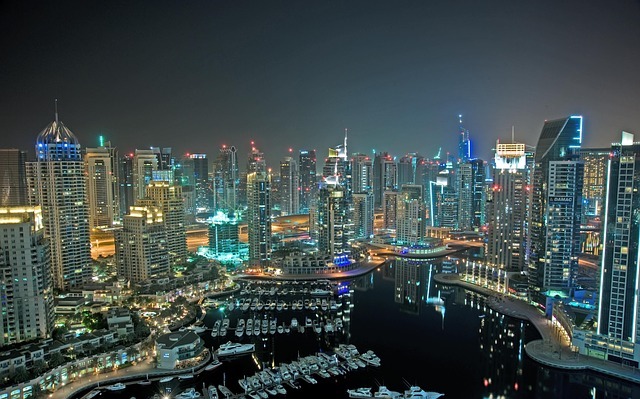 Dubai is situated on the coast of the UAE. With very little recharge and irrigation comprising 75% of groundwater use, natural water resources in this region are disappearing fast. PhD candidate Wafa Al Yamani works for the Environmental Agency of Abu Dhabi, which has contracted with Plant and Food Research in New Zealand to investigate using treated sewage effluent and groundwater for irrigating the desert forests along their motorways. Sidr trees in the UAE forest. 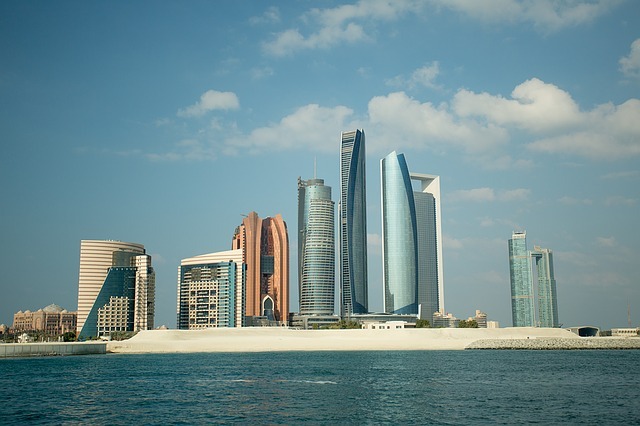 The UAE desalinates all the water for their cities, so the tertiary treated sewage effluent from these cities could be a viable resource, replacing some groundwater for irrigation of the desert forests. These forests perform a wide range of ecosystem services from sand stabilization along all UAE motorways to harboring a great deal of biodiversity. There is also a cultural association with the forests. The original ruler of the UAE, Sheikh Zayed, embarked on a program in the 1970s of “greening the desert,” so the people see the desert forests as a legacy of their founder. Infiltrometers were used to examine how the drip irrigation system worked. Researchers built dykes of 20 cm to stop surface redistribution of dripper water. 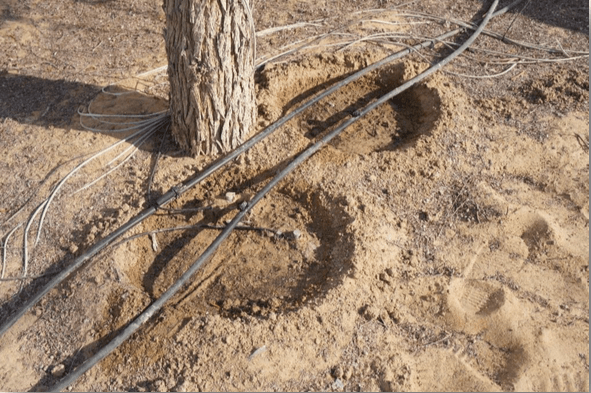 The scientists used a heat pulse method to measure tree water-use by comparing sap flow with evaporative demand (ETo). They used Time Domain Reflectometry (TDR) to measure soil water content, and they have developed a “light stick” using light sensors to detect the shadow area of the trees to measure trees’ leaf area in order to predict the crop factor that will enable prediction of tree water-use from ETo. Next week: Find out how Wafa and her team use infiltrometers to predict dripper behavior and how the treated effluent resolves salinity issues. 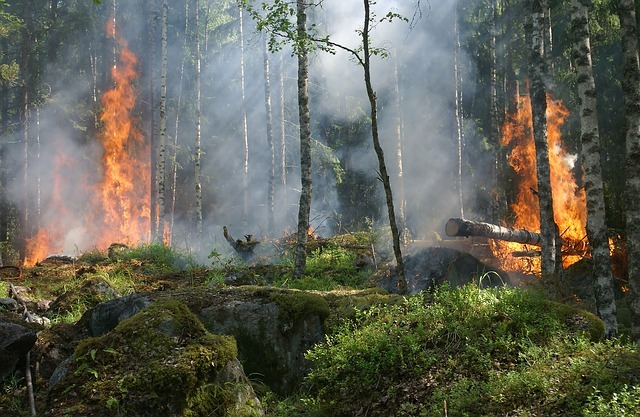 In 2015, over eight million acres of forest burned in the United States. Major fires burned in five northwestern states: Washington, Idaho, Montana, Oregon, and California. Flagstaff, Arizona is typically a dry place. But in August 2010, churning rivers flowed down roadways and around—and through—homes in the Flagstaff area. The floods were caused by a fire—the 15,000 acre Shultz fire that raged around Flagstaff from April to July, 2010. 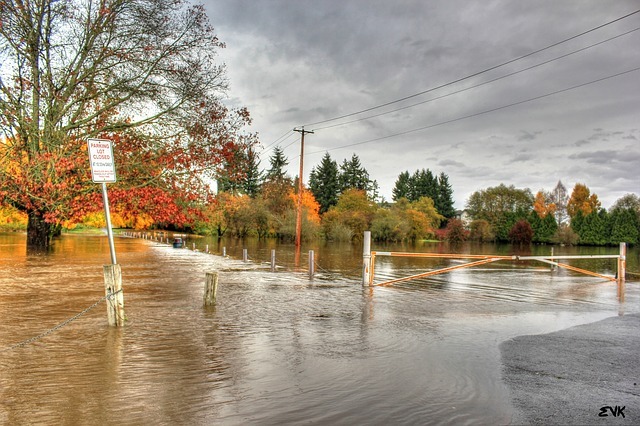 After a fire, soil commonly becomes hydrophobic, just one factor in increased runoff. One of Robichaud’s research interests is in designing a model for post-fire erosion. The model helps land managers and assessment teams in the field to evaluate the risks such erosion might pose. 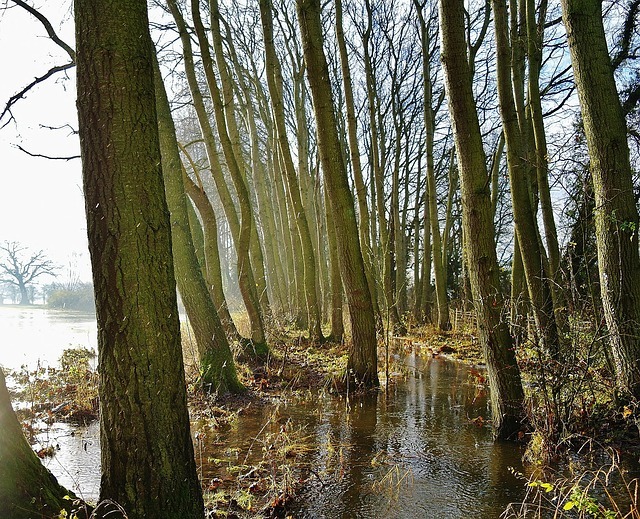 “It lets them see what might be affected if they have an erosion event,” he says. Often practitioners will use the model to establish an early warning system to areas that will be affected. Along with developing the model, Robichaud has also looked for ways to help postfire assessment teams gauge the water repellency of the soil after a fire. Historically, soil in a burned area was evaluated using the water drop penetration time test, or WDPT. Team members would place a drop of water on the surface of the soil and time how long it took to be absorbed. This seventies-era test was easy to do in the field, but Robichaud wanted something more representative. One of Robichaud’s research interests is in designing a model for post-fire erosion to help land managers and assessment teams in the field evaluate the risks such erosion might pose. As he looked for alternatives, Robichaud started using a Mini Disk Infiltrometer. Practitioners all over the world use infiltration measurements along with Robichaud’s model of post-fire erosion to assess the impacts of a fire, predict erosion, and make plans to manage and reduce the associated risks. Robichaud’s online Erosion Risk Management Tool allows researchers and assessment teams alike to use scientifically solid analysis. He’s currently involved in refining and validating the model, improving assessment techniques, using remote sensing technology to perform assessments, and looking at alternative post-fire treatment options to reduce erosion risk, among other things. To see what Dr. Robichaud’s been up to recently, read his 2014 paper, The temporal evolution of wildfire ash and implications for post-fire infiltration, published in the International Journal of Wildland Fire. Find out more about Robichaud’s research, methods for use of the Mini Disk Infiltrometer for changes in infiltration characteristics after fire, or access the Erosion Risk Management Tool, by visiting the Moscow Forest Sciences Laboratory website. Several years ago I had the chance to work at the USDA ARS Research Watershed in Riesel, Texas. The goal of my research was to look at the effects of land use and landscape position on water infiltration. Within the research watershed there is preserved and maintained native prairie, improved pasture, and conventional tilled areas, which have been in existence for 75 years. Thus we were able to use infiltrometers to study the long-term effects of those different land uses, along with the effect of landscape position within the same soil type. My research focused on the Houston Black Soil Series, which is a clay-rich soil with a high shrink-swell capacity. This soil type has key economic importance, as it is present in much of Texas’ USDA prime farmland. 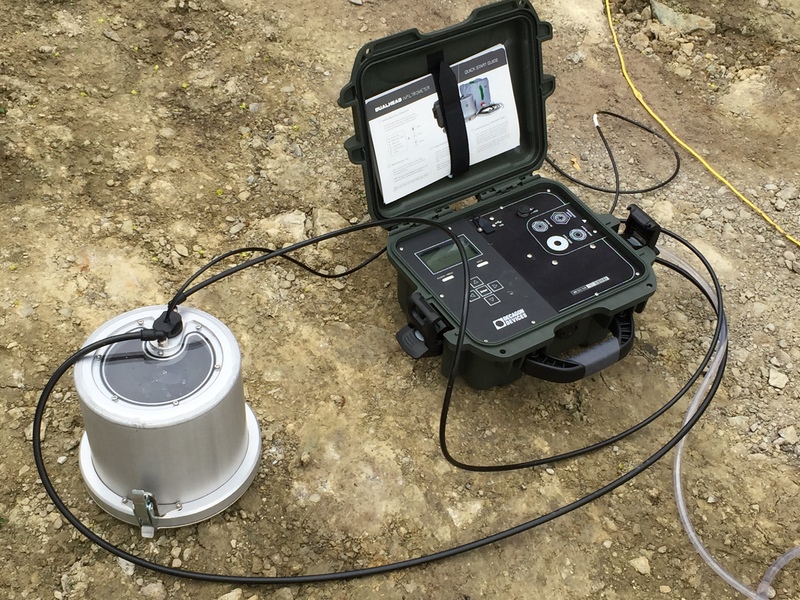 To achieve our objectives, we began by mapping soil bulk electrical conductivity using an EM38 device (electromagnetic geo-surveying instrument). The maps we created allowed us to look for areas of variability in water content, depth to parent material, clay content, and salinity. Then we randomly selected three zones within the catinas (full hill slope including summit, back slope, and front slope) and flagged them with GPS points. Our goal was to make infiltration measurements at all of the landscape positions on the slope and compare them to the same landscape positions within each land use type. 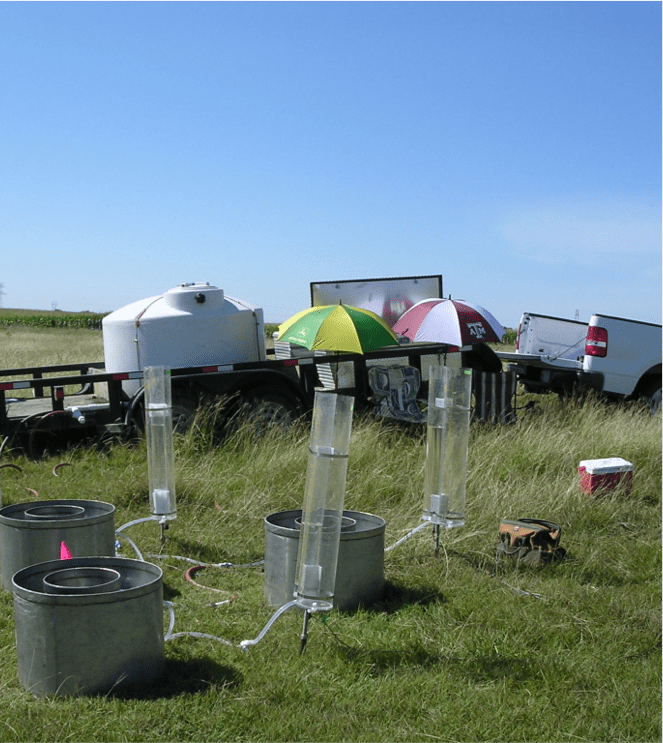 We found that the native prairie had the highest infiltration rates because the soil maintained its strong structure and macropores which allowed water to conduct well through the soil. We also found some differences by landscape position that were consistent within the different catinas. As water would run down the catina, erosion would transport soil and organic matter off the shoulder and back slope and deposit it on the foot slopes. 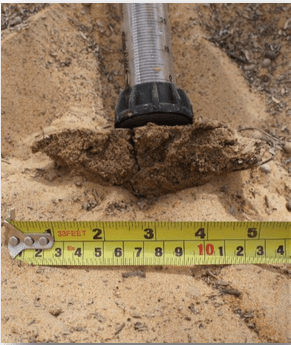 Even though they were mapped as the same soil type, the differences in erosion and reduction of organic matter affected the ability of these different positions to transport water. We chose to customize existing double ring infiltrometers to make these measurements because there wasn’t anything automated on the market. If I was going to conduct my research in a reasonable amount of time, I had to come up with a system where I could run a lot of measurements relatively easily. As a result, we bought three double-ring infiltrometers and modified them with pressure sensors and some larger controlled ports. The resulting setup was huge; the outer ring on each infiltrometer was 60 cm in diameter and the entire instrument was very heavy. We were constantly refilling the instrument water reservoirs. In fact, this setup required so much water that we had to pull a 1,900-liter water tank on a trailer wherever we were taking measurements. Our goal was to save time by running all three infiltrometers concurrently, but it still took a LONG time. Even though we had automated the instruments, they required a lot of monitoring; sometimes I had to fill our 1,900-liter water tank twice in a day. One measurement at one site took anywhere from 1.5 hours to 3 hours depending on when we reached steady state. 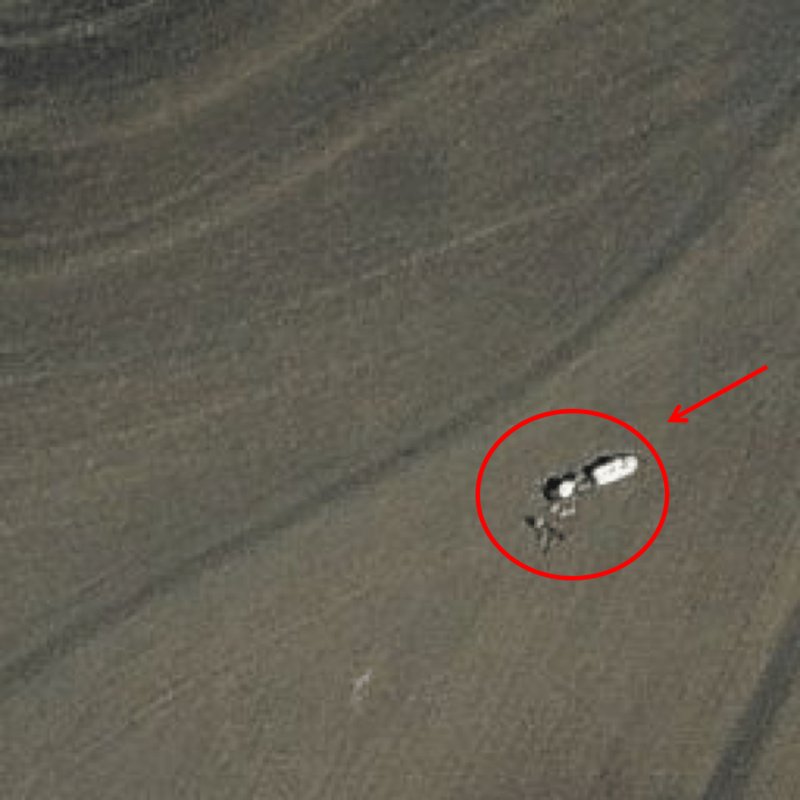 We spent so much time out in the field that we were actually caught on film in one of the Google Maps picture flyovers! Even after all this field time, the data analysis was overwhelming, despite a relatively seamless approach to handle it all. We also wanted to simplify the analysis of three-dimensional flow. With a constant head control in a single ring, there are equations that you use to correct for it. But you have to guess at things like soil type and structure which leads to inaccuracies. Multi-head analysis has been around for decades. It involves establishing constant water heights (heads) at multiple levels and looking at the difference in the infiltration rates to calculate the sorptivity. Thus, parameters that are normally estimated from a table can actually be measured, and infiltration results will be independent of users. Still, there can be problems with the multiple head approach. Increasing the water height when infiltrating into a really low conductivity soil may take 1 to 2 hours to drain back to the original height. We didn’t want to make this measurement take longer than necessary, so instead of using additional water, we used air pressure to simulate higher water levels which can be added or removed very quickly. So, thanks to the instrument hardships I endured in my past efforts to obtain infiltration measurements, we now have an easy-to-use dual-head infiltrometer (now called the SATURO), that can do the analysis of infiltration rates and saturated hydraulic conductivity on the instrument itself (it gives sorptivity and alpha, based on the soil type and structure, and makes the correction onboard). Thus, if a scientist needs a value right away, it’s there. But, if like me, they wanted to dig deeper through the data, all the measured values can still be downloaded for more careful analysis. Together, it’s a simple tool for both scientists and consultants who need to make these measurements. And they won’t get caught on Google Maps like me, because they’ve had to spend their whole life in the field taking measurements. Below is a video of the dual-head infiltrometer in action.